What is it about these lovely little creatures that make them tug at our heartstrings?It must be those bright eyes, fluffy cheeks, and beaks that seem ever-turned up in a smile. Or perhaps it’s the way they can lift our spirits as they take wing and joyfully zoom around the house. For me, it’s the way they call a happy greeting every time I walk in the door, nuzzle my hand to get head scritches, and settle contentedly on my shoulder for a nap. For all the charm of these wonderful birds, cockatiels (aka ‘tiels) are also wild animals needing special care, and like any pet, offer unique challenges and needs. Trim and graceful, a bit loud and stubborn, and surprisingly loyal and affectionate, cockatiels, like many parrots, are often one of the least understood animals that people keep as pets. I was first introduced to cockatiels before I can remember. I must have been four or five years old. When I turned seven, my parents bought me my first cockatiel, a sweet little female that I named – in my 7-year-old kind of way – “J-Love,” short for “Jessica Love,” because she was so gentle and affectionate. Since then, I have shared my life with a few different ‘tiels, each one as unique and with as strong a personality as the next. After the loss of my precious cockatiel and close friend Horseshoe about a year ago, my boyfriend and I adopted two adorable three-month-old cockatiel siblings: Sokka and Boo! This has been my first time raising young cockatiels since I was very little, and needless to say, it has been quite the adventure! Next is Sokka’s sister Boo: she is the more independent of the two, and is also a lovely cinnamon split-for-pied. She LOVES to explore and play, but still enjoys head scritches. Her favorite foods are millet, egg, and edamame. Her favorite pastimes include hanging upside down like a bat, running around on the floor, and trying to pick human noses (weird, I know). Both birds may have had a rough start to life, and I’m afraid I know nothing about their parents. They are rather small birds (75 and 82 grams), and poor Boo is pretty much crest-less, despite going through several molts now. 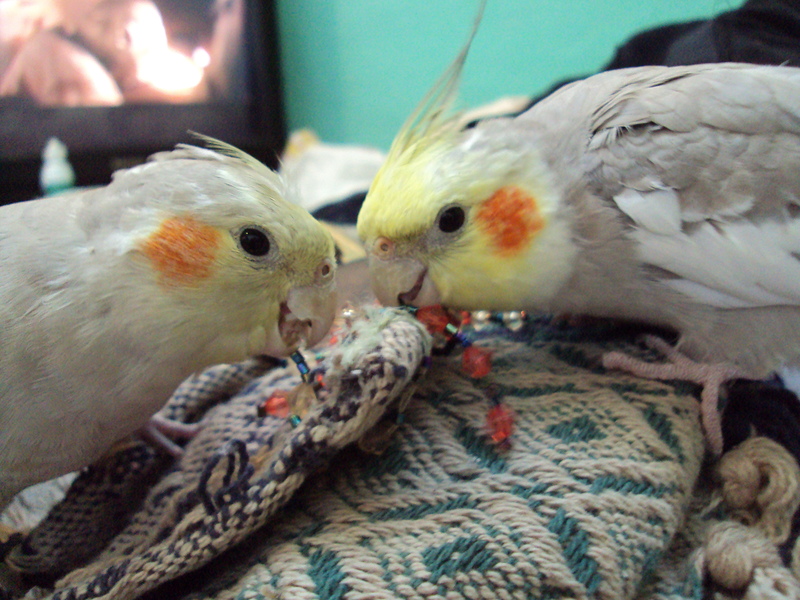 But don’t be fooled: Sokka and Boo are very energetic and healthy cockatiels! And so loving, you could never tell that they were once terrified of humans. We still have many years together, and much to do in training, toy making, etc. Please feel free to follow along, if you like!